Come to HMNS After Dark for a Sweet Surprise! You may use artificial sweeteners in your tea or coffee, maybe even sprinkle some on your food, but there’s nothing quite like the miracle fruit to make sour foods more palatable. Just gnaw on one of these berries for a minute, let the juice coat your tongue, and for up to an hour, everything from plain yogurt to lemons to Sour Patch Kids taste just as sugary as Lucky Charms! 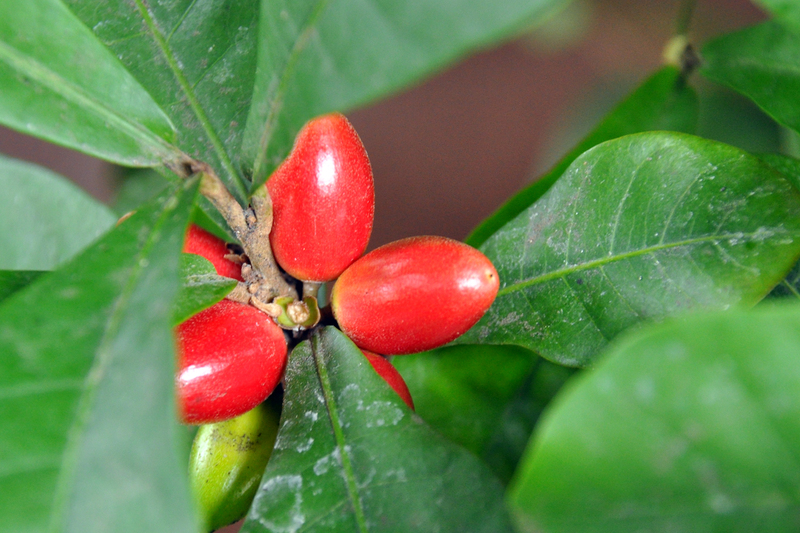 Meet the berries of the miracle fruit plant (Synsepalum dulcificum). After eating just one, everything else tastes a little bit sweeter for up to an hour. Here’s how it works: the berries of the Synsepalum dulcificum plant, which we cultivate in the Cockrell Butterfly Center at the Houston Museum of Natural Science, contain a protein named miraculin after the effect they have on your taste buds. The protein confuses the sensitivity of the sweet and sour-tasting areas of your tongue, tricking your mouth into thinking certain foods are filled with sugar. That’s right… If you munch a miracle berry, you can eat a whole pile of lemons without making a face! But be careful. Your tongue might be fooled, but your stomach will know the difference. Because we’ve just harvested a crop of these miracle berries from our own miracle fruit plant, we’re offering an opportunity for you to try this magical plant out for yourself. Come to HMNS After Dark next Wednesday, March 30, from 5 to 9 p.m. and visit the booth outside the CBC to try a berry and experiment with its effects. We’ll give away both berries and snacks to sample along with them completely free to guests enjoying our new after-hours schedule! 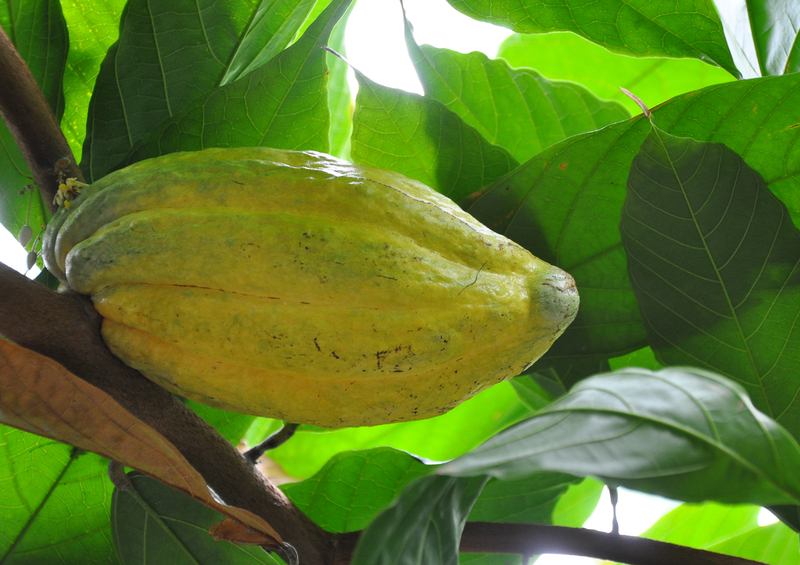 This is the seed pod of a cacao tree (Theobroma cacao), from which we make cocoa butter and chocolate. Inside this pod are fats, oils, and cocoa beans. 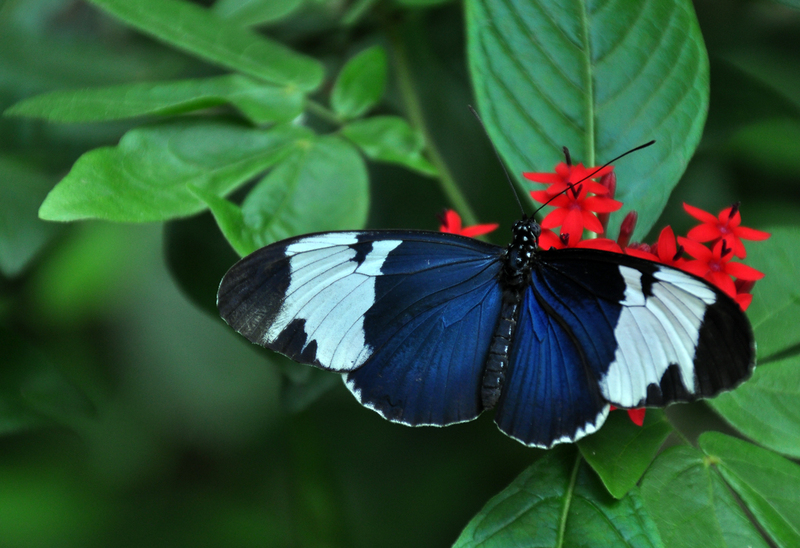 While you’re snacking, pop into the CBC to visit our incredible butterfly collection and see how other kinds of tropical fruit grow. 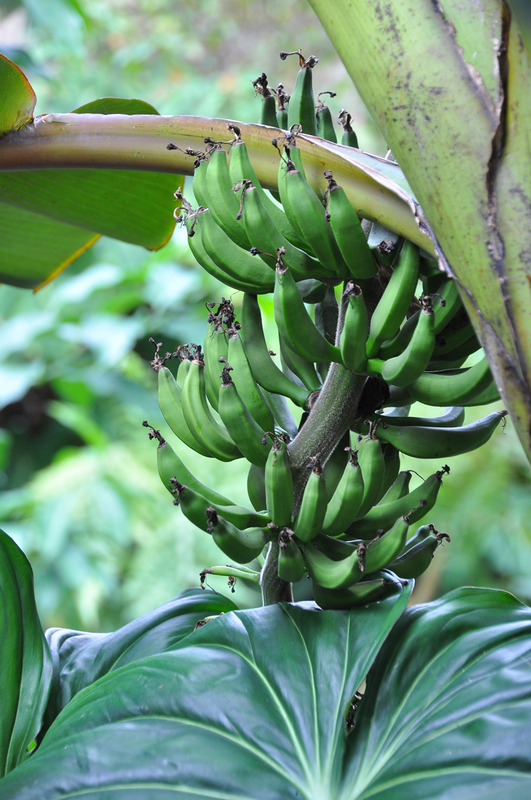 You may now know it, but we grow papaya, pineapple, bananas, cocoa and coffee right here in the museum, along with several other kinds of exotic edibles! It’s another way you can learn about the interaction between pollinating insects and the plants that need their help to produce fruit. Check out these photos of fruit-producing specimens, taken right in our own rainforest! 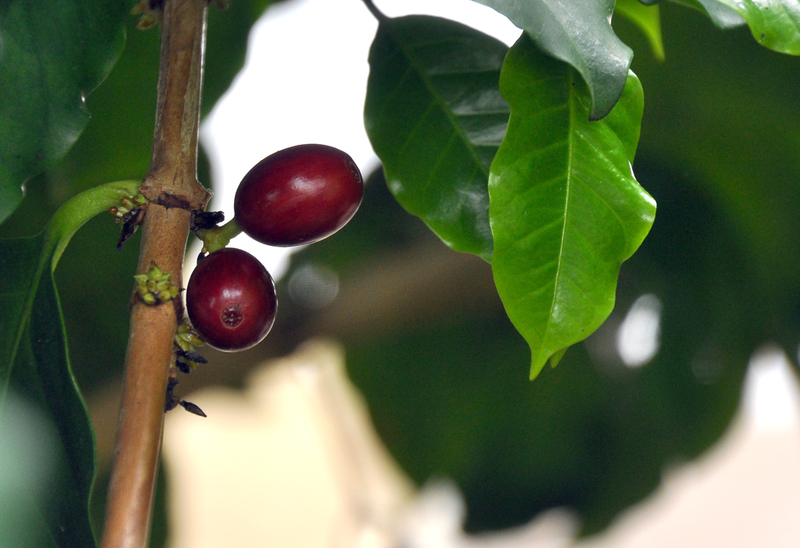 Coffee beans (Coffea arabica), not to be confused with cocoa, grow individually. Once the fruit is removed, the bean is roasted and then ground to make America’s favorite hot beverage. 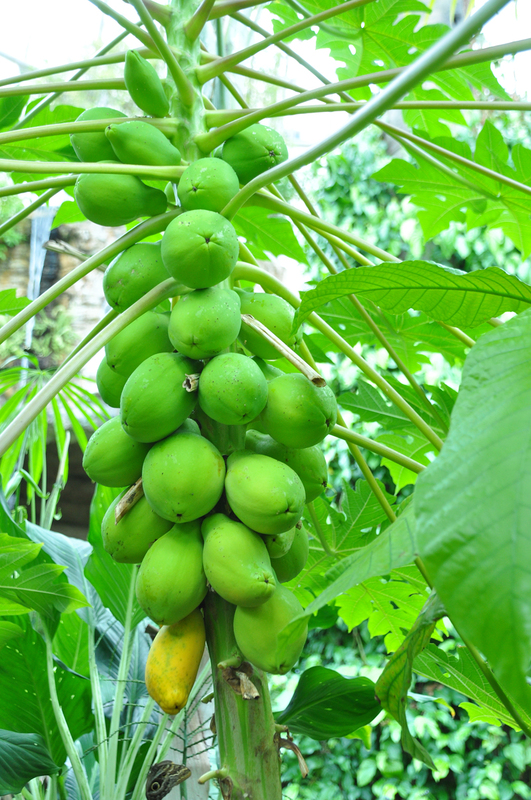 Papaya trees (Carica papaya) bear their fruit in a row along the main stem. Except for the yellow one at the bottom, these are still far from ripe. It looks like the large pineapple in back is sneaking up on the smaller one in front. 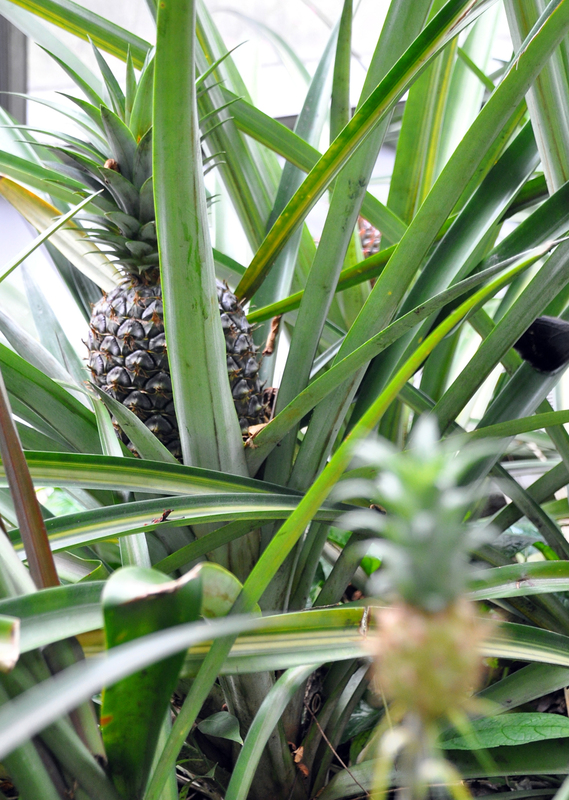 Pineapple plants (Ananas comosas) are a terrestrial bromeliad. These red bananas (Musa acuminata) aren’t ripe yet, but they won’t grow much bigger than this. They’ll just turn red. That’s it for the familiar ones. Have you heard of these three below? Yes, this is an edible fruit! 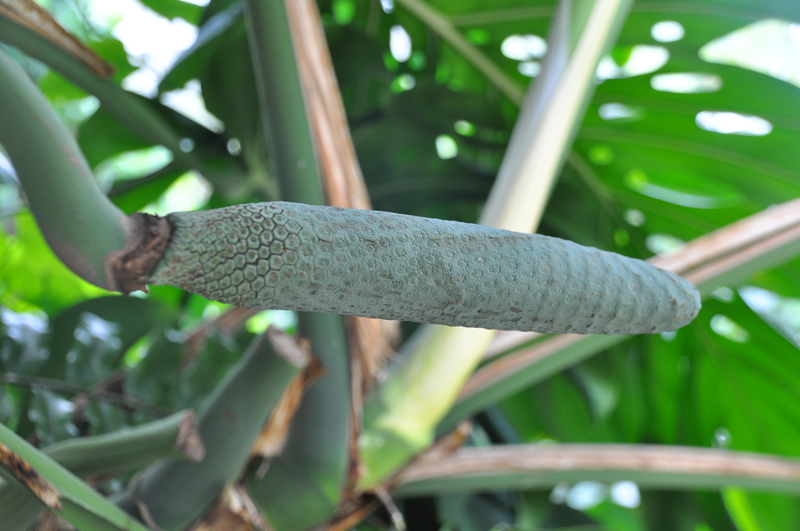 It’s called Monstera deliciosa, which grows in Central and South America. 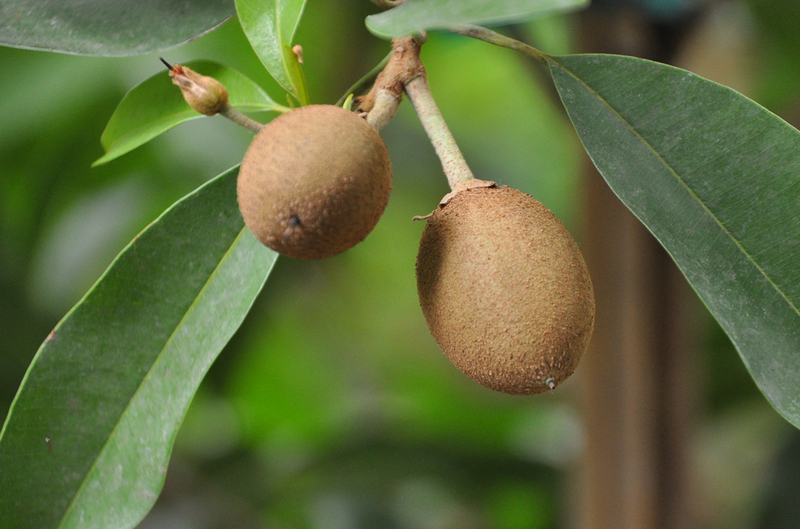 The sapodilla plant (Manilikara zapota), bears fruit that looks similar to a kiwi, but is orange inside. 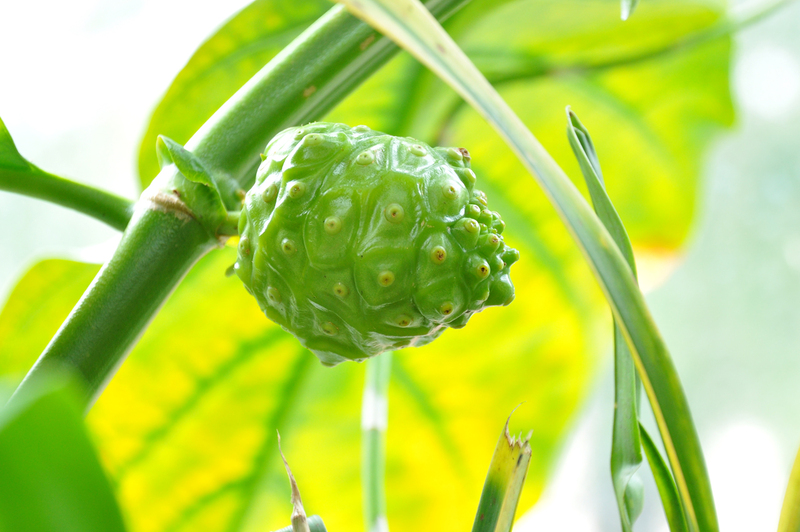 The noni fruit (Morinda citrifolia), also known as the cheese fruit or vomit fruit, is edible, but it produces a foul odor that makes eating it quite unpleasant. Some other fruiting plants in our collection aren’t producing at the moment, but are still worth a look. Keep your eyes peeled for the vanilla orchid, avocado, starfruit, rose apple, guanábana, and guava. Whatever you find, in the CBC at HMNS After Dark, you can definitely expect a sweet surprise. Our butterflies are some of the most spectacular on earth, and without them, many of these fruits would never reach maturity. So next time you’re at the CBC, thank a butterfly!